Hello again…..well, I have not blogged for a while since an uninvited guest known as, “Mr. Pneumonia” has come to visit 3 out of 4 of us in my household for the last couple weeks. Me included. Not the “quiet-comfy-hospital-stay-with-room-service” type of pneumonia, it was the “buck-up-and-get-on-with-life-walking-pneumonia.” Whatever “walking pneumonia” means – not much walking for me. I could barely get my achy body out of bed long enough to pick up my kids from school and run through yet another drive through for dinner. I think we are on the mend though. While I was sick though, my friend Cindy Meester from a wonderful Speech-Language Sharing Blog at http://meesterc.wordpress.com/, sent me a promo code on behalf of Smarty Ears, for a wonderful articulation app called, “Articulate It!”. Smarty Ears was founded in 2009 by Speech-Language Pathologist, Barbara Fernandes (also know as blogger, GeekSLP) and they have about 30 educational apps now available for mobile devices. This articulation app is a great supplement for speech therapy and price ($38.99) is about what a clinician would spend on a box of articulation stimulus picture cards. The app has over 1200 stimulus cards, which a great value when one considered how much they have spent over the years on boxes of cards, or making their own stimulus cards with clip art, etc. The app has a short, user-friendly tutorial which I recommend taking a few moments to watch – you will pick up on all kind of tips for customization and data collection. A clinician can set up separate accounts for students/clients, and track progress easily. The app offers work for all phonemes, and even phonological processes as well. You can have individualized programs (called “sessions” in this app) for multiple students running simultaneously. So, if you are working with a speech group with three students working on different phonemes, you can have the app programmed to show individualized stimulus pictures at the same time while working with the group. One of the best part of this apps is a Phrase/Sentence level offered as well. Some of the other articulation apps I have explored just have stimulus items at the word level. The voice recording mechanism is very good quality and is useful for student self-monitoring. On future app updates, I would love to see some more features to increase the app’s entertainment value for kids – perhaps fun reinforcement sounds or simple games. But, I can see the value in this app for the 1200 stimulus cards it offers – you could use the app for stimulus cards, and pair it with other games or activities you might do in your speech room. 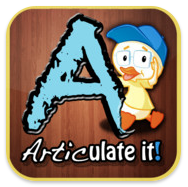 Check out Articulate It! at the AppStore. This is a universal app compatible with the iPhone, iPod Touch and iPads. And GUESS WHAT???!!!!! My blogger friend, Cindy Meester and Smarty Ears have given me 2 more promo codes to give away for this app! Here’s how you can win a code: Become an email follower on my blog by noon central-standard time on Monday January 16th, 2012 and I will randomly draw 2 folks from the pool of the current and new followers to win the promo codes. I will email the winners privately first, and then I will publicly post the winners on the site next week! THANK you so much to SLP blogger, Cindy Meester and Smarty Ears for providing this opportunity!